Kerri and I had a blast again at White Birches... looking forward to our return trip next year! If you're looking for a 7-seater at a reasonable price, check out the Dodge Journey. Lots of good deals available now on 2015s. I'm going to write more about White Birches soon... Jenny's incredible. Yes, I'm looking at 7-seaters. But I'm not going to buy until 2016. There are a good number of 7-seaters on the market, but unless they're of the very large type, pick your compromise between seating and cargo capacity. I've driven a number of Ford's newer "EcoBoost" (what a stupid name, IMHO) vehicles, along with many other turbocharged vehicles (owned and not) over the years. When you're on the boost, forget about the "eco", and the way that Ford has done the engine-turbocharger setup on their cars, you're on the boost a LOT. Fuel consumption rises exponentially, not arithmetically, as you get on boost. There's really no right or wrong here: Ford has gone with small turbos, which spool up much quicker to provide more torque off the line that the (sometimes too) small engine doesn't have on its own. North Americans are used to the shove of solid torque off the line (torque is what gets a vehicle going, but everyone focuses on horsepower), and typically drive with really heavy feet. Just watch people pull away when a red light turns green. You'd think it was a drag strip Christmas tree. 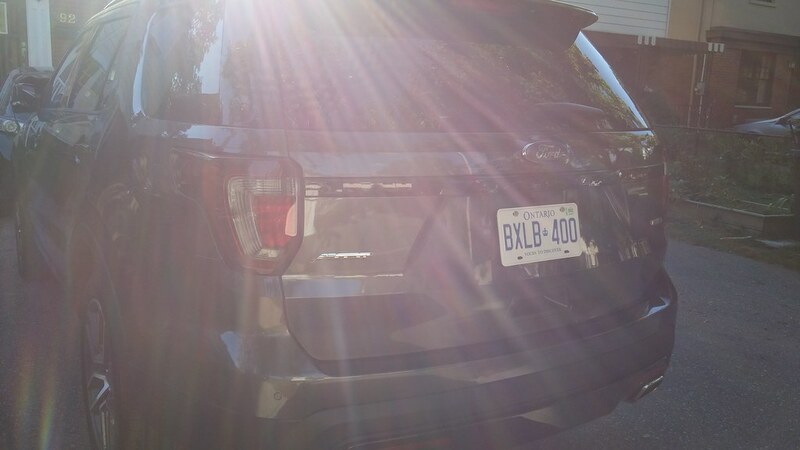 The number one complaint on Ford EcoBoost vehicles (apart from pre-2015 versions of SYNC)? Poor real-world fuel economy versus even the now somewhat pessimistic Canadian and US government numbers. If you could look at a boost gauge on most of the EcoBoost vehicles, you'd be stunned at how often the engine goes into boost mode. How was the fuel mileage, or could you not resist keeping your foot off the pedal? Usually with the 3rd row, you almost don't have any storage behind the last row, did you have a roof carrier, or was there sufficient room for a tent etc.? 2nd picture looks like Jarvis doing a pre trip inspection of the tires! Meant to ask what the MSRP is? @ TorontoMike - well, the feeling is mutual. We can't wait to get back up there next season. I didn't take the Explorer camping, so I didn't have to load in the tents and sleeping bags and cooler and bbq, etc. Good thing, too... because there wasn't room for all of that unless we left the third row empty. 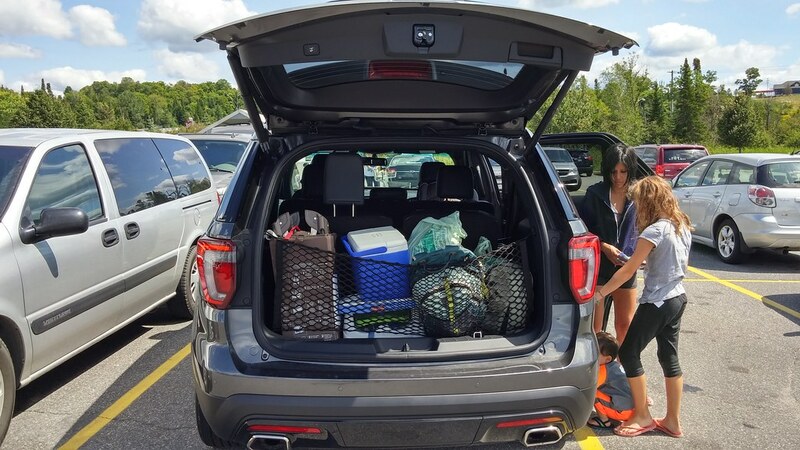 The Yukon XL went camping with us, and had more than enough cargo space. 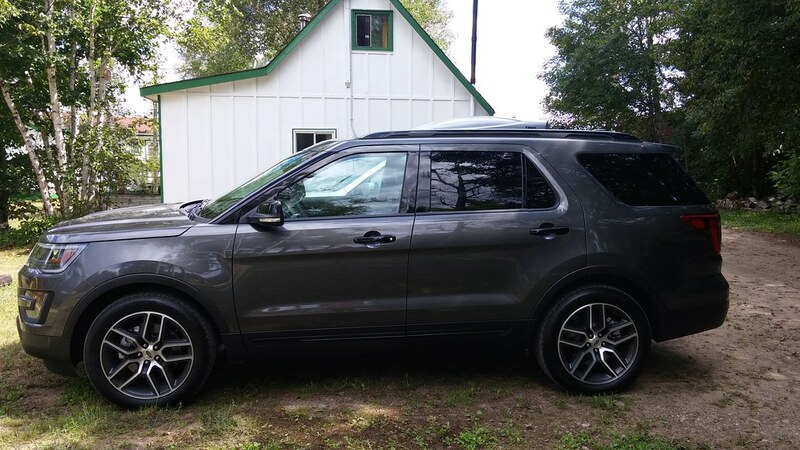 MSRP is $37,142 for the basic Explorer. I drove the Sport version, which is $53,996. SYNC is awesome. I love it.